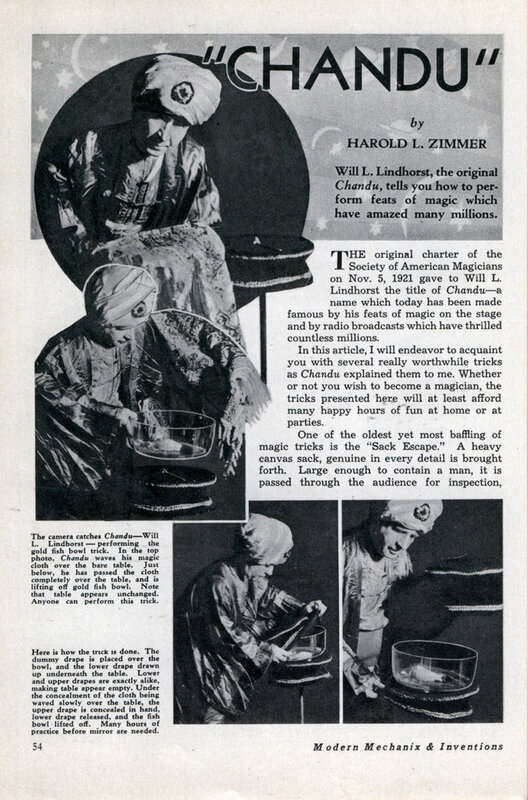 Will L. Lindhorst, the original Chandu, tells you how to perform feats of magic which have amazed many millions. THE original charter of the Society of American Magicians on Nov. 5, 1921 gave to Will L. Lindhorst the title of Chandu—a name which today has been made famous by his feats of magic on the stage and by radio broadcasts which have thrilled countless millions. In this article, I will endeavor to acquaint you with several really worthwhile tricks as Chandu explained them to me. Whether or not you wish to become a magician, the tricks presented here will at least afford many happy hours of fun at home or at parties. One of the oldest yet most baffling of magic tricks is the “Sack Escape.” A heavy canvas sack, genuine in every detail is brought forth. Large enough to contain a man, it is passed through the audience for inspection, everyone agreeing that it is a sack. A solid metal rod, with holes in either end to admit padlocks, is also passed about. A man crawls into the sack, the rod is slipped through rings at the top, and padlocks are snapped into each end. Chandu waves his cloth in front for a few seconds, and lo! the man has escaped. The sack remains locked—but empty. Keys? He didn’t have any—and even if he had, he couldn’t have worked even a finger through to use them. Take two minutes and try to guess how it was done. Now—here’s the answer: In the first place, there are two bars. They both look alike, even upon close inspection, but the solid one is passed around the audience. When the man crawls into the sack, the fake bar is slipped through the rings, and the padlocks snapped into place. Behind the cloth screen, the imprisoned man reaches for the two locks through the sack. Twisting them in opposite directions separates the bar, as the two halves are threaded to fit together like a nut and bolt. In a second or two, he has stepped out and replaced the bar in its original position in the eyelets. However, even this simple trick depends on the magician’s skill in palming the real bar and substituting the other before the eyes of his watchers. Another trick which has long baffled theater audiences is the gold fish bowl illusion. 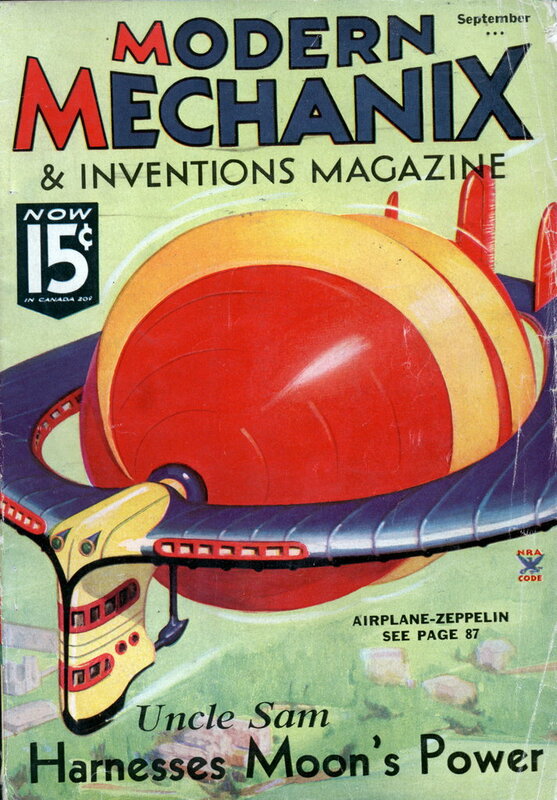 A small, circular stand is displayed in the spotlight, bare except for a short, fancy velvet trimming around the edge. A single center leg supports it. Chandu steps out, armed with only his magic cloth. No suspicious bulges are apparent about his person. He passes his cloth slowly over the table-top, whisks it away, and there before your startled eyes he is holding a large fish-bowl, filled with water and fish! How did he do it? He had nothing concealed on him. The table? Examine it. The short drape? Lift it up, look underneath it—nothing but an innocent table with a piece of velvet drape—apparently just like it was before he started. We say apparently—for it really isn’t. If you were to measure it, you would find the table about four inches shorter than it was before. Have you guessed it yet? Well— there are two drapes, exactly alike. The one below is pulled up out of view with a string, much in the manner of an opera hat. Thus, the upper drape, hanging in a natural position, seems to be the only one. The flat top of the table, naturally, is bare. Now—Chandu sweeps his cloth over the table and pulls off the upper drape, which folds into a small parcel in his hand. Underneath, the bowl full of fish and water is resting on the real table top. He quickly picks this up, and moves away from the table. As he leaves, the lower drape clicks instantly down into place and the table looks the same as before. All this happens in a split second, while he passes his cloth over the table, seemingly all in one slow movement. The secret of this is to keep the spectators’ eyes on him and not on the table. When they glance again at the table, they fail to notice its reduced height. This next one is an old standby—the magic cabinet trick. The frame of a shallow cabinet three feet square is produced. Through holes bored in the three-inch wide closed sides two wooden rods are thrust through, to further prove the cabinet is open. There is no room anywhere to conceal anything. Two open frames are brought forth, and hooked over the front and rear of the cabinet. A paste brush is applied to the rear frame, and a piece of paper pasted over it, closing it. The front frame is treated likewise. The cabinet is now covered, front and back, with paper. Chandu’s magic wand strikes the front paper, tears it, and pulls out a fair-sized canary cage with a live bird in it! The cage is about six inches square and deep—twice too large to even fit in the cabinet. The trick is simple. A drop leaf in the top falls down when a pin is pulled (remember the last time he pulled the rods out and re- placed them?) and a collapsible cage, carefully folded about the live bird, drops down to the bottom of the cabinet. It is half open when it drops, due to concealed springs, and springs into full size as it is drawn out of the cabinet. Try These Magic Tricks Here are a few tricks you can perform at home with easily-obtained apparatus: The Spirit Cane: An ordinary cane is brought forth and stood between a person’s legs. A few mystic passes over it, and the stick begins a weird dance, seemingly in thin air. Cut a piece of fine black silk thread, and attach bent pins to each end. The lights are dimmed, and at the first opportunity the pins are fastened to each knee. The cane is requested, and, as you make passes over it, grasp the invisible thread and make a loop over the cane. Spread your legs, and the cane will hop and dance. Picking One Particular Paper From A Hat: Tell your friends you can pick out anyone’s name—or your own—from a hat. Each person writes his name on a piece of paper, then you are blind-folded. Pretending to be a medium with supernatural powers, you take the paper you wish to pick out later, roll it up just as the others have done, and toss it carelessly into the hat with the other name slips. After shaking the hat, you reach in and pull out the correct paper. How? You’ve rolled a pea or bean up in the paper. Read Sealed Messages Spirit Reading: For this last trick you’ll need a small sponge, a long rubber band and a bottle of acetone. Fasten one end of the rubber band above your elbow, then put on a coat or jacket with full sleeves. Pull the rubber band down and tie it about the sponge. In a side pocket, uncork the bottle of acetone and moisten the sponge. Tell your friends to write a few words on pieces of paper and place in separate envelopes. Wave an envelope about to attract attention to it. Now—make a few passes over the envelope with your right hand, wetting it with the sponge soaked in acetone. Raise it quickly upward. You will notice that your side of the envelope is almost transparent, allowing you to read the message clearly at a glance. He did magic on the radio? That must take a lot of practice. Oh well, Edgar Bergen was a radio ventriloquist. No kidding slim. Thats like me telling people over the internet that I can levitate and am doing it right now. Who’s to say I’m not?